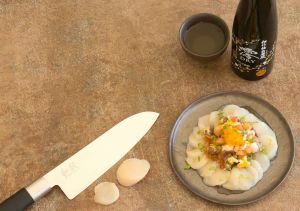 Thinly slice the scallops, mince the green onions, dice the tomato. Place squid, green onions, tomato and cilantro in a bowl. Season with lime juice, grated ginger, salt & pepper. Toss well and place in the fridge for 30 minutes. Place the sliced scallops on a serving dish. Cover with the marinated squid. Garnish with yuzu tobikko. Serve.